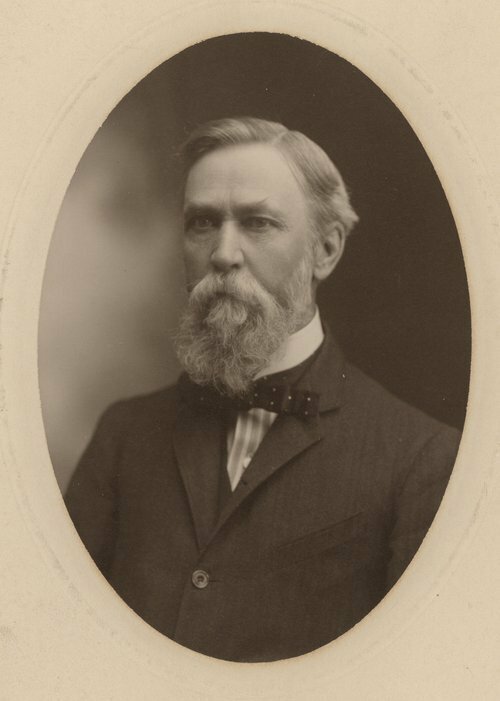 This sepia colored photograph shows Nelson Case, (1845-1921). Case a graduate from the University of Michigan settled, in May of 1869, in Oswego, Kansas to practice civil and criminal law. Considered an honest and honorable lawyer among his peers, Case was appointed, in June of 1880, by Governor St. John as a probate judge. He was twice re-elected to the bench but didn't seek a third term. Case soon returned to practicing law and crusading for prohibition. A long time supporter of the temperance movement, he successfully banished saloons from the town of Oswego and rallied for the constitutional amendment of prohibition. Actively involved the community, Case served as the city attorney of Oswego and the editor of the Oswego Independent newspaper. He was also a member of the Republican Party, and was appointed to the board of regents at the state normal school in Emporia. In his spare time, he authored a number of books including "The History of Labette County" and "The Constitutional History of the United States".